You know who my favorite character from the G1 Transformers cartoon was? Well, it was actually Soundwave as he had all of the tapes and had this really awesome robotic voice. But my second favorite character from the G1 Transformers cartoon was the Decepticon who got left behind on Cybertron. Yes, Shockwave was a great character. He only had one eye like a cyclops. Instead of a left hand, he had a gun in its place. And, like Spock from Star Trek, he was a creature of logic. Oh, and he could transform into this really magnificent laser gun. So, I’m really happy Takara decided to make a Masterpiece figure based on Shockwave as I do love the character. They had to call him Laserwave due to copyright issues, I guess… but it’s still the Shockwave I grew up loving! However, after my disappointing experience with MP-28 Hot Rodimus, I was not very confident that the figure was going to live up to the Masterpiece namesake. However, he still is my second favorite character from the cartoon, so I just had to get him. Was he worth the purchase? Let’s find out! Now, when you do get Shockwave… I mean, Laserwave out of the packaging and in your hands, you’ll immediately notice some glaring problems. I really have to mention the trigger lever in his gun mode. There isn’t much clearance to wrap your finger around it so it does feel a little dinky. The trigger also has a habit of springing up into his body for no apparent reason. 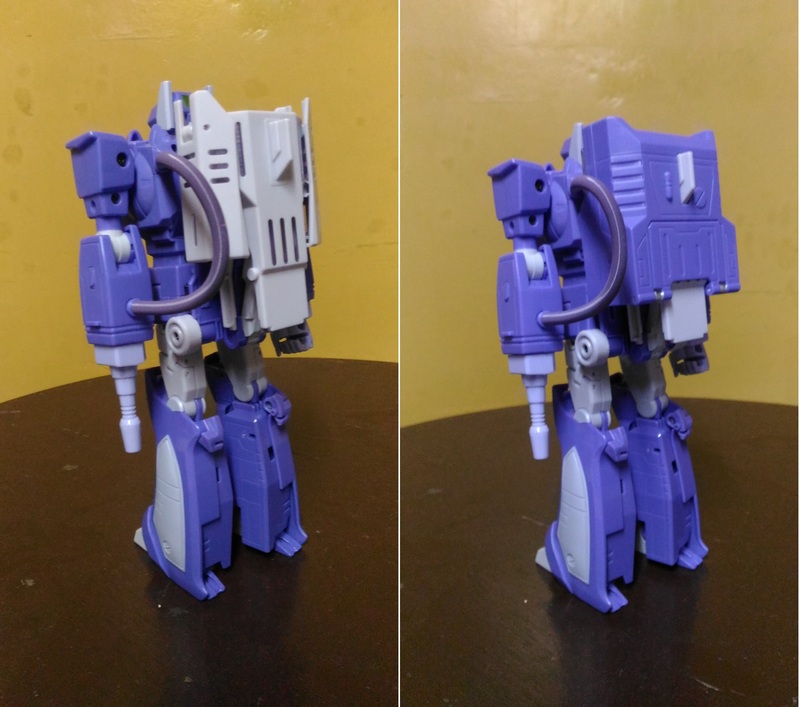 This is a part of his transformation as the trigger folds up into his torso in robot mode so that he doesn’t look like he has an erection like the original G1 toy did! But I do wish there was a way to lock it in place so that it doesn’t inadvertently roll upwards for no reason. Look at that cute little trigger that you can barely get at! Also, the purple they used seems a shade too light. I know the G1 cartoon has a lot of quality control issues which led to lots of animation issues and colorization problems. 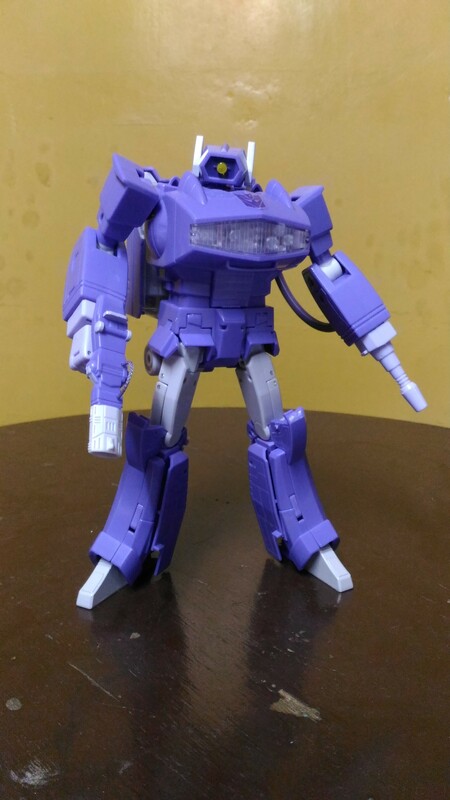 But I don’t remember Shockwave’s purple ever looking this… flamboyant. It’s not a huge problem but it does make him look a little more plastic-y than I would like. But the biggest problem is when you look at it from the back. There’s a big gaping hole right in Laserwave’s rear area. There’s also another big hole on the handle. It’s pretty ugly but the hole is there as it’s needed for it to facilitate its transformation into robot mode. 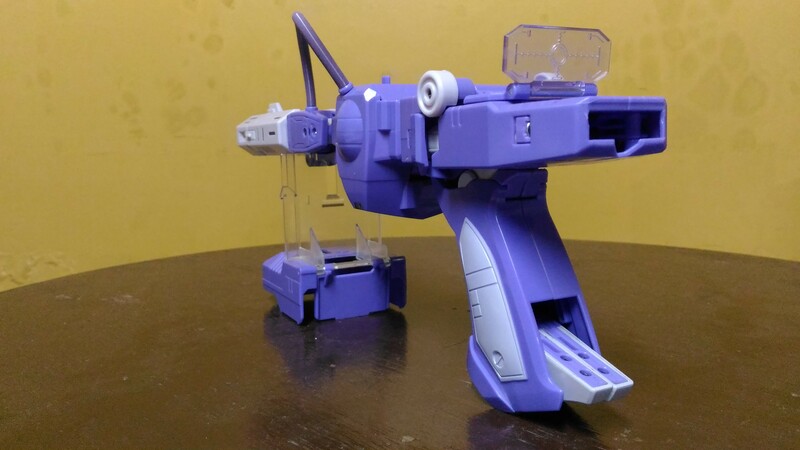 However, I don’t think anyone would pose the the figure in gun mode and purposefully show this hole as the front area does look incredible and it does pose an almost exact likeness to Shockwave from the cartoon. Is there any idiot who would show off his expensive Masterpiece figure in this way? Thankfully, despite all of Masterpiece Laserwave’s shortcomings in gun more, his robot mode is a goddamn hot! It’s amazing how the engineers at Takara got him to look almost exactly like Shockwave did in the cartoon… besides the funky color, that is. One of the things that concerned me was the muzzle piece and how they were going to integrate it into his robot mode. With the original G1 toy, you had to take out the muzzle as it didn’t have a place in his robot mode. Oh, they had to make a compromise but it was a rather smart compromise. The muzzle actually folds up into his backpack. It’s definitely not cartoon accurate but, you know what? It actually doesn’t look half bad! It certainly doesn’t look like he jammed his muzzle into his back as there is some transformation involved. Also, you don’t need to detach it from the figure as there’s this really long die cast arm connecting it to the rest of the body. 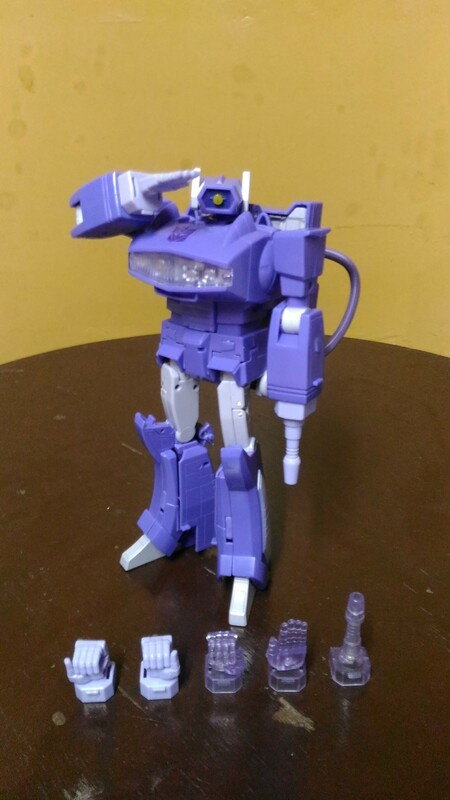 Oh, but if you really want Laserwave to look like Shockwave from the cartoon, you can still do that! If you look at the pictures above featuring the figure in his gun mode, you’ll notice a little stand. Well, the stand serves a double purpose as you can fold it up so it covers the muzzle really nicely! Win-win! MP-29 Destron Laserwave comes with a slew of accessories. Not as many as, say, Ironhide and his honking tool chest of weapons. But Laserwave comes with some really neat accessories. I do have to talk about his “hose” which was a prominent feature of the original toy. Here, it doesn’t have a function but you wouldn’t know that it’s not a piece of rubber which could dry out and crumble. The guys at Takara had the brilliant idea to use a really flexible spring instead! Okay, maybe rusting may be a problem in the future but at least it would disintegrate like the original rubber hose would. While Laserwave already has a gun permanently affixed to his left arm, Takara decided to take one of the weirdest animation errors of the cartoon and make it an accessory! 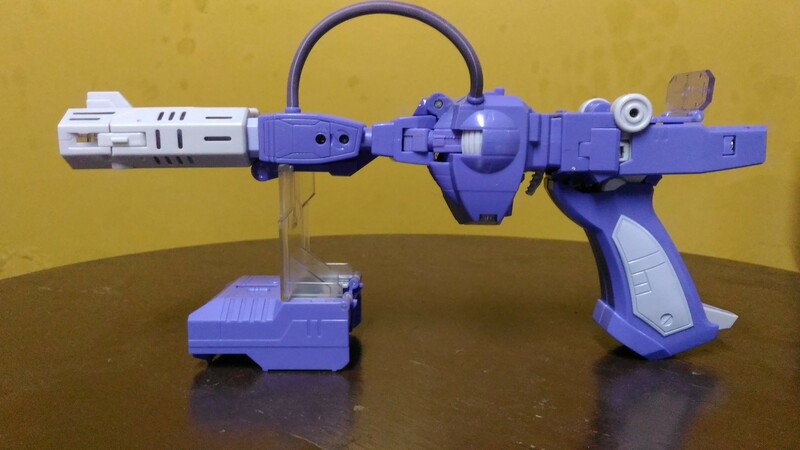 The figure comes with a gun that looks exactly like Laserwave’s gun mode! It’s a weird little accessory but it is kinda funny to see him holding himself… and not in a sexual way! It would’ve been hilarious if he transformed into a little Mini-Laserwave! So, what other accessories does Laserwave have. Well, he has a lot of hands! Hands just like the original figure and in all the animation errors he was featured! You want to replicate the scene where the animators forgot he only had one hand? Well, you can replace the left arm cannon with an actual working hand! You want to give him clear hands and a clear gun arm cannon like the original G1 toy? You got replacements for that as well! But the best replacement hand has to be the saluting hand. As far as I remember, Shockwave saluted Megatron only once in the original animated show. However, it was a rather iconic look so, guess what? Takara included two saluting hands: one clear and one opaque! Oh, you can’t really have him do a full on salute as his elbow joints don’t allow Laserwave to reach that far. But, with some creative camera angles, like the one below, you can sort of make it look like he is! Besides the elbow issue, the articulation on Laserwave is superb. It’s easy to get him into some really dynamic poses with ease. Also, he doesn’t feel top heavy despite having a backpack. I guess it helps that the feet are made out of die cast, ensuring he has really solid footing. Laserwave is also mostly ratchet joints so you’re sure he’ll keep his hand up for extended periods of time! Finally, I have to talk about the lighting gimmicks. Like the original toy, Laserwave lights up when you pull the trigger in gun mode as long as you put in the appropriate AAA batteries in his back. Now, as the trigger folds up into his torso in robot mode, Takara decided to add a separate switch so he can fire his left arm cannon in robot mode. However, you need a different set of batteries as it’s on a totally different set of electronics. I do wish they managed to somehow wire Laserwave so you only needed one set of batteries but it is a minor gripe. Overall, I would say I’m pretty satisfied with Laserwave. It does look like Takara had to compromise by making his gun mode really inferior to his robot mode but that was the right call. Laserwave’s robot mode certainly looks great and definitely nails the look of Shockwave. I would rather get a not-so-good gun mode but get an awesome robot mode any day of the year. I’m extremely happy with MP-29 Destron Laserwave and, if you’re a big Shockwave fan or just a fan of really expertly engineered toys, you owe it to yourself to get Laserwave. What do you think of MP-29 Destron Laserwave? Let me know in the comments section below!